Basic membership starts at $10, and there are different levels of membership. FONL membership includes many benefits, like coupons to use at the sales. ​To join, complete and submit the membership form here. Your membership is tax-deductible, and is used directly to promote literacy in our community! ​When you purchase books at any of our many book sales, you support the Norman library system and its many programs. We have four major book sales through the year, as well as other special sales. Find out about all of our sales here. We also have ongoing sale shelves at Norman Central all year round, with books restocked several times a week -- all for $1 or 50 cents! Find out more. 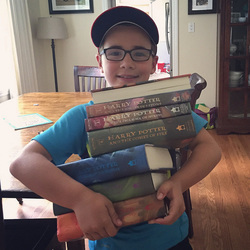 ​Donate your gently-used books and other items to the Friends! We accept books and other materials at the Sorting Center, just south of the central library. Find a map and more info here. ​The center is open Tuesdays and Thursdays, 10 a.m.-2 p.m. If you can't make it during those hours, you can drop off books at Norman Central library. ​There are many ways to volunteer for FONL, from working in the Sorting Center to helping with the book sales to serving on the FONL Board or committees. All levels of activity and time commitment are available! Check out all the types of opportunities here.